Wow! That was some #amwriting birthday #blogparty! It was the busiest day ever---for both the hashtag and the #amwriting website. So. Much. Fun. The Amwriting Blog: The beginning point for the blog party. I talk about the hashtag and how it started. I provide links. Robert McKay's Chronicles of a Wandering Writer: Robert describes #amwriting as, "a continuously running Twitter chat that is an endless font of inspiration for writers." L.S. Taylor's What I Learned Today: L.S. offers a not-to-be-missed filked song, featuring #amwriting, "To the tune of: "Truck Stop In LaGrange"
JC Rosen's Girl Meets Word: JC remembers early days of #amwriting and thanks all for the continued support and writing advice. We love you too, Jess! Gem State Writers: I blog with a wonderful group of Idaho writers. Here I offer you a tour of my home state and explain one reason #amwriting is so important to me. John Ross Barnes' Love This Live, Onward Through The Fog: John has an amazing, poetic voice. Here he talks about how #amwriting gave him more confidence to accept his journey forward as a writer. Linda Poitevin's Angels Gather Here: Linda takes time out from her busy schedule to share her #amwriting space---and a great photo of her keyboard kitty. LK Gardner-Griffie's blog: LK describes how she found #amwriting through #amwritingparty---very cool. Khyiah Angel's author page: Khyiah talks about hearing voices in her head---and how only other writers understand it! Johanna Harness' Big Thoughts: I post some pictures from the last couple years---including my previous twitter pics and some photos from the 2010 PNWA conference. PJ Kaiser's Inspired by Real Life: PJ says #amwriting has "become an entire platform of not just Twitter chat, but valuable content over at the #amwriting site along with author profiles so we have an opportunity to showcase our work." She also links to a picture of her office space! Jamie Ridenhour's Blog: Jamie shares his office space. I especially like the skull! Everett Maroon's Trans/Plant/Portation: Ev describes meeting me and @KerrySchafer at the PNWA conference last year. He says I've "built something of a benevolent empire," and that really makes me smile. Carol Despeaux's One Wild Word: You don't want to miss the fire hydrant picture. That's all I'm saying. Julie Butcher's Fire Drill: Julie invites us into her #writerclubhouse for birthday cake. I'm loving the clubhouse. Johanna Harness' House Lamb: I teased everyone with a partial pic of Baxter the House Lamb and now I unveil the full pic. @KerrySchafer says he "looks like such a dork." Yeah. Isn't it great? Lily White LeFevre's Blog: Lily shares her office space and also a haiku "to be read in the style of William Shatner." Jennifer Spiller's Blog: Jenn shares memories of writing with a five-month-old. (I remember those tweets!) She also calls #amwriting a writer's "spiritual gatorade." Gotta love that. Another House Lamb Photo: So Kerry would have a nice counter-balance to the dork-lamb photo, I posted another of Baxter in shades. David Ozab's Fatherhood, Etc. 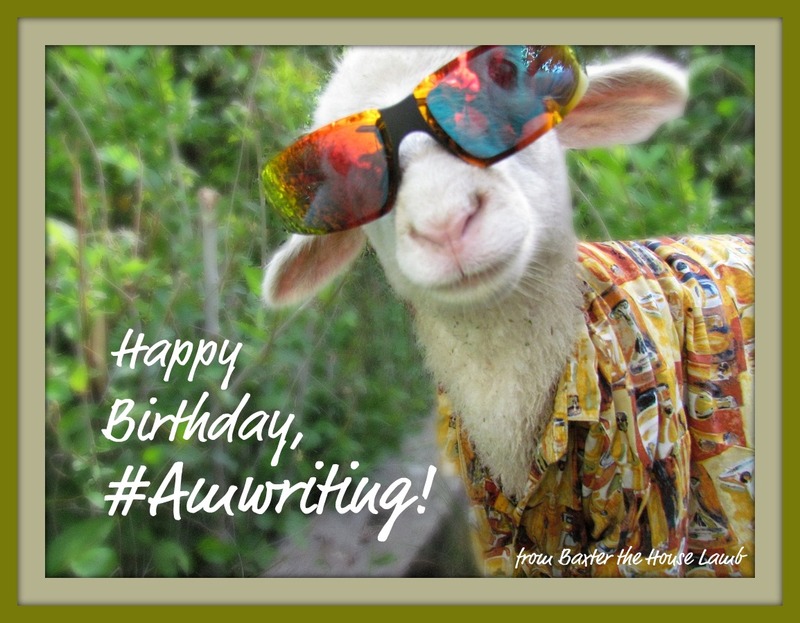 : David looks back on his last year using the #amwriting hashtag. Go, David! I can't wait to see what the next year brings. M.K. Hutchins' Books, Board Games, and Writing: I met M.K. just this week! She came to my twitter talk in Boise. I was so happy to see an entry from her here. In her post, M.K. talks about using the #amwriting hashtag without realizing it was a group---and she also discusses deadlines. Phoebe Jane's La Vita Ho Vivere: Pheobe Jane says she follows #amwriting like, "the white rabbit to a world of other writers." Mike St's Many Stories: Mike shares his writing space. I especially appreciate his mention of rituals. Elizabeth Saunders' Travels With Books: Elizabeth does a great job explaining why Twitter is such a great platform for writer support. I will point people to this blog post when they ask, "why twitter?" Robyn Leatherman's The One AM Pen: Robyn says she appreciates that, "information is shared about the writing world and not hoarded as private property." Nik Barnabee's Blog: Nikki ends our party with her short story, "Written in Stone." Many thanks to all who participated, whether as bloggers or readers (or both). It was a great day and I'm already hearing talk of next year. Whew. I need to get some writing done before then! Back to work. That was a Hella-Rawkin Web - Bash. Never experienced exactly that. - "Vuja - Day - That feeling that somehow, somewhere, this Same thing has never ever happened before". And in my head: I hear Jimi Hendrix - "Well, Are You Experienced? Have you Ever been Experienced? Well, I Have."